Bring on the flavours! This chicken with harissa dish is a full-flavoured stunner of a dish. And it’s brimming with healthy, ingredients as well. This is also a perfect dish to serve to meat-eaters and vegetarians at the same time. The chicken with harissa is cooked separately from the squash tagine, and there is left-over harissa for everyone to add to their portion of food. You can buy ready-made harissa but I make my own. It's not difficult to make and it tastes so much better than supermarket varieties with their added preservatives and E-numbers. If you want to go half-way, you can buy already roasted peppers in jars. The harissa can be made a day or two in advance. You can serve this chicken with harissa dish with the tagine alone, or with quinoa or couscous as well. Start by roasting 2 red peppers. Preheat the oven to 220C/ 425F/gas mark 7. Put the peppers into a roasting tray with a dash of olive oil and cook for 15 minutes, turning them from time to time, or until the skins blacken. Place the peppers into a bowl and cover with cling film. Set aside for 10-15 minutes, until the skin comes off easily. Break the peppers open, pull out and discard the stalks, pith and seed and peel off the skin. The roasted peppers will be used for the harissa. This can be made well in advance. 1. If you are making your own harissa, start by roasting the peppers. Once they are ready, put all the ingredients into a food processor and process to a smooth paste. Unroll the chicken thighs and put them flat on a roasting tray covered with baking parchment. Spread about half of the harissa over the chicken thighs. Cover and leave the chicken with harissa to marinate in the fridge. Turn on the oven to 200C/ 400F/ gas mark 6. 2. Add the saffron to the hot stock and leave to the side to infuse. Heat the oil in a large saucepan, add the onion, ginger, chilli and garlic to the pan and cook over a low heat for 5 minutes. Add the cinnamon, turmeric and ground coriander (cilantro), stir and cook for a further 2 minutes. 3. Add the chopped tomatoes, season with some salt and pepper, stir and cook for 5 minutes. Add the butternut squash and sweet potato and pour in the stock with saffron. Bring to the boil, then lower the heat, cover with a lid and gently simmer for about 20-25 minutes, until the butternut squash and sweet potato are soft. 4. While the tagine cooks, transfer the roasting tray with the harissa-covered chicken thighs to the oven and cook for 20-22 minutes, until the chicken is completely cooked through. If you are serving the chicken with harissa together with quinoa or couscous, get that cooking while the chicken is in the oven. 5. 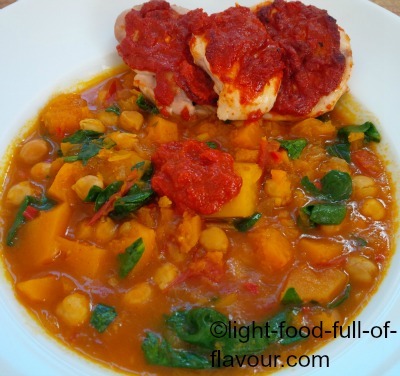 Just before serving, add the rinsed chickpeas and spinach to the squash tagine and heat through. Check the seasoning and serve with the extra harissa on the side.